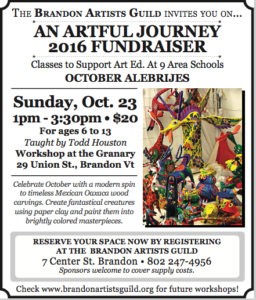 Sunday October 23rd, Todd Houston, Art teacher at Lothrop school in Pittsford will teach ” October Alebrijes” !! Yes, celebrate October with a modern spin to timeless Mexican Oaxaca Wood carvings. Students ages 6 to 13 can create fantastical creatures using paper clay and paint them into brightly colored masterpieces. Registration fee is $20 for this fund raising class. Register at the BAG or phone 247-4956 with a credit card to hold your child’s spot. Supplies included. 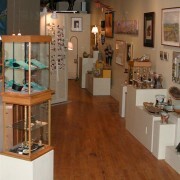 Classes at the Granary, Brandon, VT, 1-3:30PM.